With the arrival of summer, everything seems to slow down just a little bit. Maybe it’s the memories of summers off during childhood, or the sense of new adventure the season brings. 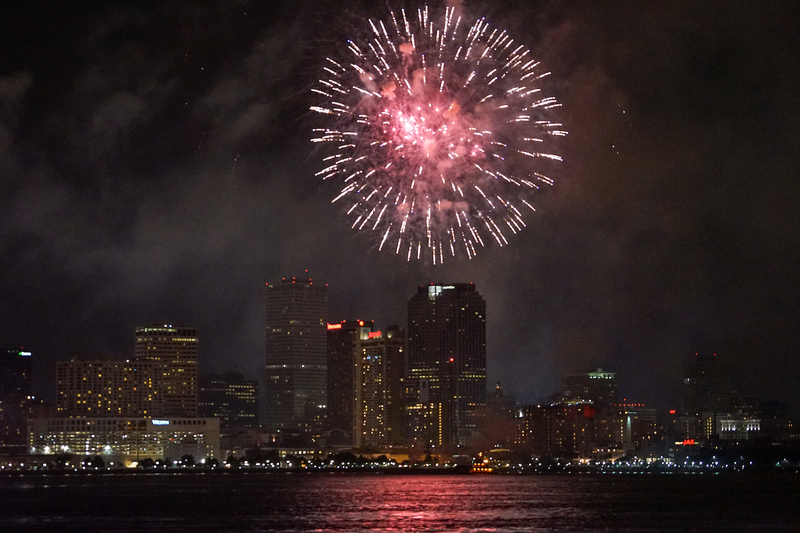 Whatever the case, the month of July presents an opportunity to slow down and enjoy what New Orleans has to offer. Whether you choose to attend the annual New Orleans Shakespeare Festival at Tulane, have a lunch date at the new Pythian Market, or jam out to the Roots at the 2018 ESSENCE Festival® Presented By Coca-Cola®, we have plenty to keep you busy for the month of July. Regardless of politics, race, gender, religion, sexual orientation, or country of origin, the United States’ Independence Day is a time for all to come together and celebrate—with fireworks and beer. While New Orleans did not become part of the U.S. until 1803 with the Louisiana Purchase, we still know how to celebrate. As part of Go 4th on the River, the main fireworks display is a pair of dueling barges from the Mississippi River. Watch the show on the newly renovated and reopened Moonwalk (the riverfront park on the edge of the French Quarter), or spread out a blanket on the levee across the river in Algiers Point to watch from there. Spain ruled the colony of Louisiana, which included the Isle of Orleans, for four decades from 1762 until the Louisiana Purchase by the United States in 1803. In exploring this historical connection, the Cabildo is hosting the exhibit “Recovered Memories: Spain, New Orleans, and the Support for the American Revolution” through July 9. The Cabildo itself operated as the seat of the Spanish colonial city hall in New Orleans. The exhibit features hundreds of historic artifacts, documents, artworks, and more that shed light on Spain’s influence in New Orleans. Curated items come from both the Louisiana State Museum’s collection as well as from Spain. Spanish contributions to the exhibit include original portraits of Spanish colonial Louisiana governors Antonio de Ulloa and Bernardo de Gálvez and the original British flag captured upon their defeat at the Battle of Baton Rouge in 1779. The 2018 ESSENCE Festival® Presented By Coca-Cola® returns to New Orleans from July 5-8 for a long weekend celebrating black culture through music, entertainment, and empowerment. Known to the broader public as a music festival (this year’s lineup includes big names like Janet Jackson, Mary J. Blige, the Roots, Snoop Dog, Big Freedia, DJ Jubilee, and Idris Elba), ESSENCE also provides a series of free workshops and educational sessions, including the 2018 ESSENCE Day of Service on July 5 and the Stay Woke Panel on July 7. Other sessions focus on community and culture, entrepreneurship and career development, wellness and spirituality, technology, and wealth that work to empower people through education. 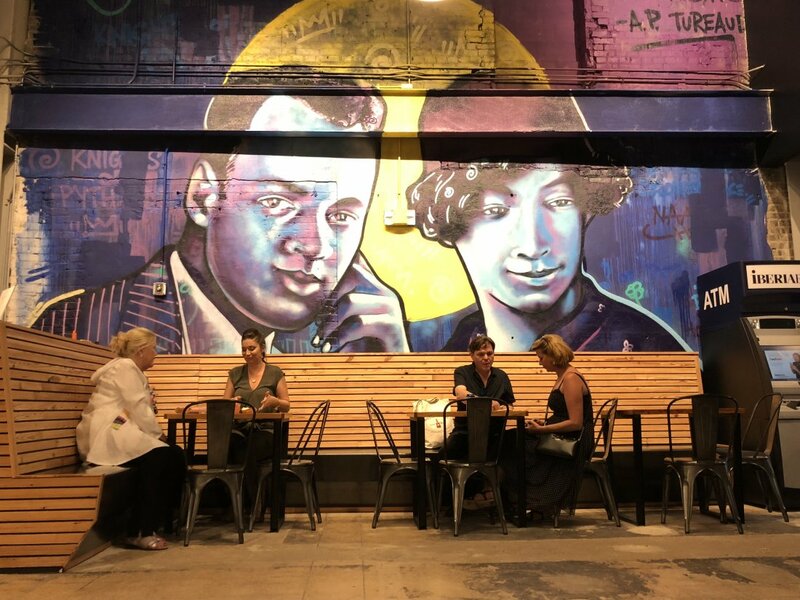 A newly-opened upscale food hall, the Pythian Market leaves a mostly polished yet mildly urban impression—thanks to Brandan “Bmike” Odums’ latest mural of local Civil Rights leader A. P. Tureaud and his wife Lucille. The mural, located towards the rear of the food hall, pays homage to the site’s central role with members of the African American community in decades past. Today, vendors like La Cocinita, 14 Parishes, Central City BBQ, Little Fig (from 1000 Figs), and Roustabout Coffee Co. wrap the walls, snaking through multiple rooms of the ground floor. The Pythian Market is open for breakfast, lunch, and dinner. In order to stave off the hot and humid climate, make a plan to recharge at a local pool. There are several public swimming pools around town (such as the Stallings St. Claude Recreation Center and the Whitney Young Pool). However, if you are looking for an upgrade, there are also several hotels around town (including Le Meridien, Ace Hotel, the Omni Royal Orleans) that allow non-guests to access their pools for a fee. Not quite sure what you are looking for? 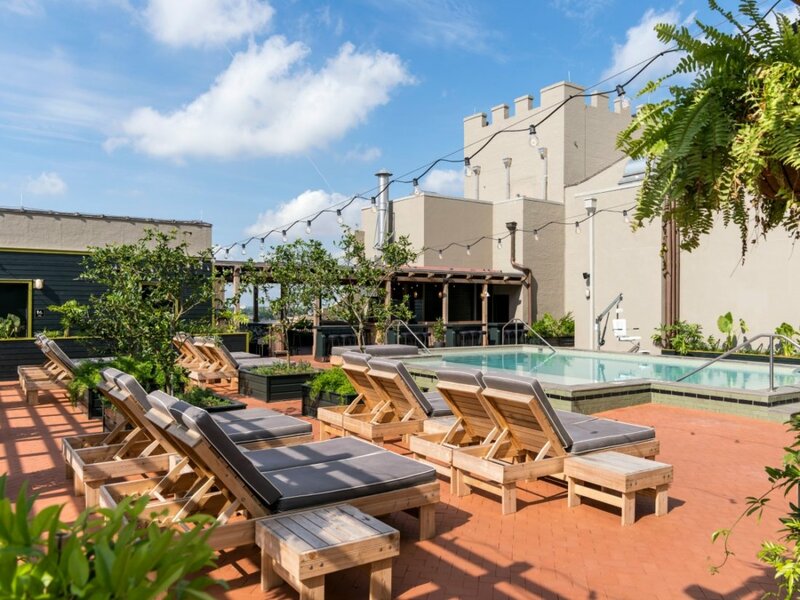 Try the more low-key pool at The Drifter, a recently opened hipster-style hotel, or the Country Club, the popular drag brunch spot in the Bywater. On a hot or stormy summer day, while away an afternoon or evening at the movies. The Prytania Theater is perhaps the best known remaining single screen neighborhood movie theater in the city and can make for a nostalgic outing. The newer Broad Theater boasts four screens and a bar. The Orpheum Theater hosts a free summer film series with films including The Princess & the Frog (July 12) and Mary Poppins (July 26). For another chance to stay cool indoors, head to Rock n’ Bowl in Mid-City on July 8 for Rock, Ride, & Rescue. The event helps to raise money for several animal-based charities, but it also promises to be a good time. Sunpie Barnes and the Sunspots will provide the musical entertainment for the event. Help increase funds raised by buying raffle tickets or bidding on an auction item. Tickets are just $10 in advance and $15 at the door. Food and drink, as well as bowling (with or without bumpers) will be available for purchase. Mid Mod, or Midcentury Modern, is a design movement that permeated the architecture, graphic design, and furniture industries from around 1933 to 1965 (though some argue this trend lasted from 1947 to 1957). Interest in this design style has reignited, and the Preservation Resource Center in partnership with the New Orleans Architecture Foundation and DOCOMOMO US/Louisiana have partnered to present a thorough investigation into and celebration of midcentury modern in New Orleans. Two Mid Mod NOLA events take place in July. On July 12, enjoy a screening of Designing Life, a documentary about the modernist architect and student of Frank Lloyd Wright, Albert C. Ledner (find tickets here). On July 26, use 3D modeling to tour the Rivergate Convention Center, which was demolished in 1995 to make way for Harrah’s Casino. The building was perhaps one of the city’s most significant pieces of Midcentury Modern architecture (find tickets here). In 1789, while New Orleans was under Spanish colonial rule, France was experiencing food shortages, high taxes, and the militarization of Paris. Amidst growing fears that King Louis XVI hoped to stamp out any inkling of a political revolt, citizens looted firearms from Hôtel des Invalides and then stormed the Bastille on July 14 of that year for gunpowder—inadvertently freeing the prisoners held captive there. Bastille Day, France’s national celebration, is now observed yearly on July 14. 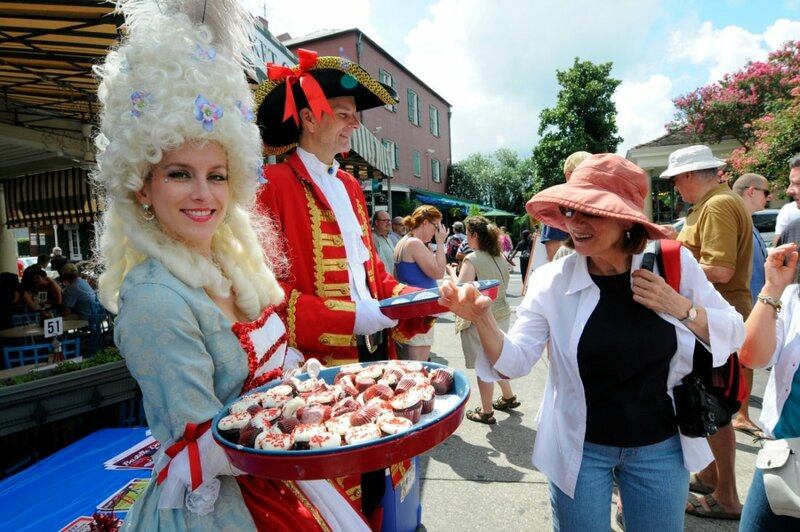 In New Orleans, the Alliance Française of New Orleans, Consulate General of France in Louisiana, French-American Chamber of Commerce-Gulf Coast Chapter, and others will host a local celebration on July 13 with live music, dancing, performances, and food trucks (including Frencheez, Boucherie, and Crêpes à la Cart). Baseball is a favorite American past-time and perfect for the month of America’s independence. Local minor league baseball team the New Orleans Baby Cakes hosts games throughout the month with several promotions. Celebrate Thirsty Thursday and Dog Day on Thursday, July 12 and 26 with $2 domestic drafts (12 ounces) and dogs are welcome. Can’t make it out during the week? The Baby Cakes will have fireworks following the games on Friday, July 13 and 27. For the Potterheads out there, the Baby Cakes stadium will become Hogwarts for the night on Saturday, July 28 in celebration of Harry Potter’s birthday. Costumes are encouraged. The New Orleans Shakespeare Festival at Tulane is an annual celebration of the playwright’s works, now in its 25th year. With a focus on exposing the Gulf South to Shakespeare, it presents multiple works each year. Traditional shows include Macbeth (July 6-22) and King Lear (July 11). Additionally, By Any Scenes Necessary: Julius Caesar (July 18) is a spoof in which performers throw out the script and incorporate improv in a raucous recreation of Julius Caesar. The New Orleans Museum of Art has had fantastic exhibits back to back as of late. One of which is Lee Friedlander in Louisiana, a photographic exhibit of an American photographer’s portraits of local jazz musicians, cultural practices such as second lines, and street culture. 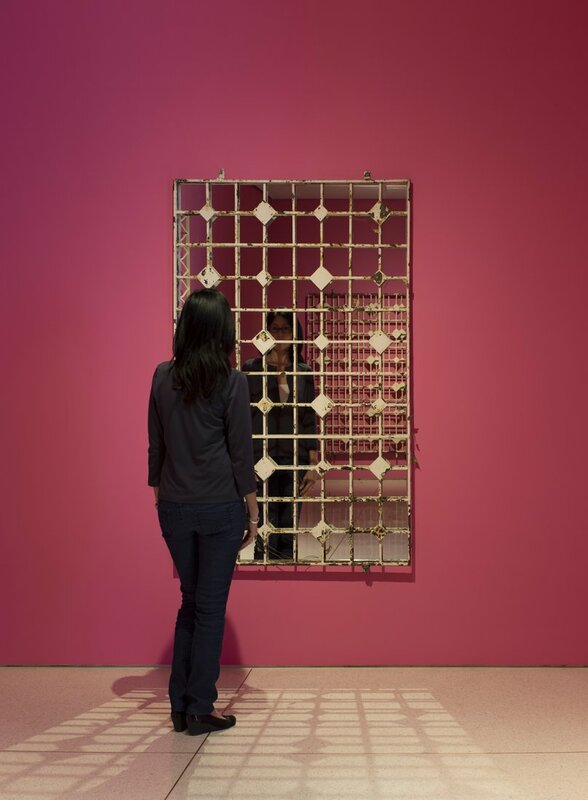 In Carlos Rolón: Outside/In, the artist delves into connections between New Orleans, Latin America, and the Caribbean, as well as themes of immigration, class, and commerce. Works are multidisciplinary in nature and include oil paintings and sculptural installations, and offer opportunities for engagement and reflection. Both exhibits runs through July. While it isn’t exactly like the real Encierro, or Running of the Bulls, in Pamplona, Spain, the local celebration of San Fermin in Nueva Orleans is still fun and less dangerous. 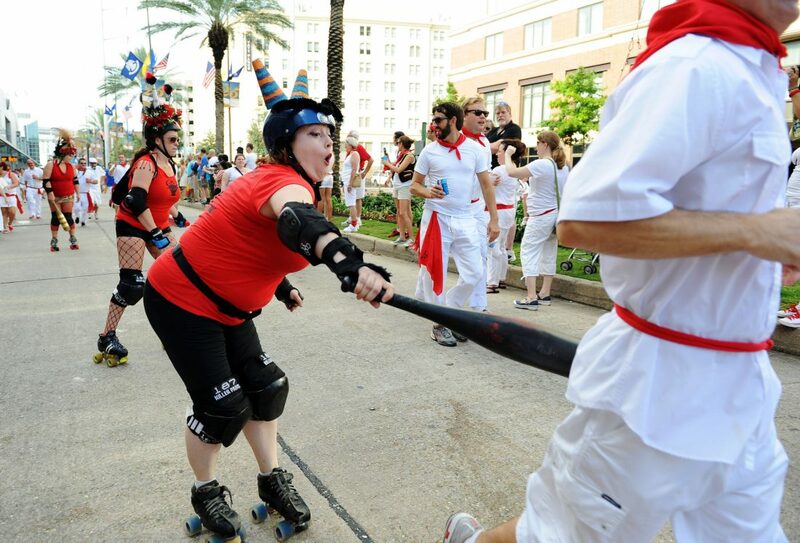 In place of live bulls running loose through city streets, members of the Bill Easy Rollergirls rollerskate after runners with plastic bats. San Fermin in Nueva Orleans is a full weekend affair, with the running of the “bulls” the morning of Saturday, July 14. Other weekend events include Ernest Hemingway-inspired burlesque (remember The Sun Also Rises?). Tickets are available here, and sales raise money for Beth’s Friends Forever and Big Easy Animal Rescue. Tales of the Cocktail returns for its 16th year on July 17-22. Tales of the Cocktail is a business conference mixed with a festival and tailored for those in the bar and spirits industry, including bartenders and distillers. Others interested in cocktail history and culture should also attend. The festival offers over 300 events including seminars, tastings, book signings, cocktail tours, dinners, and awards. Individual tickets are sold for each event.